I'm the type of person that finds inspiration for recipes from all over, even on Facebook. I recently became connected with another food blogger, Homemadezagat, who uses all of these great Caribbean inspired spices and fruit in her dishes. 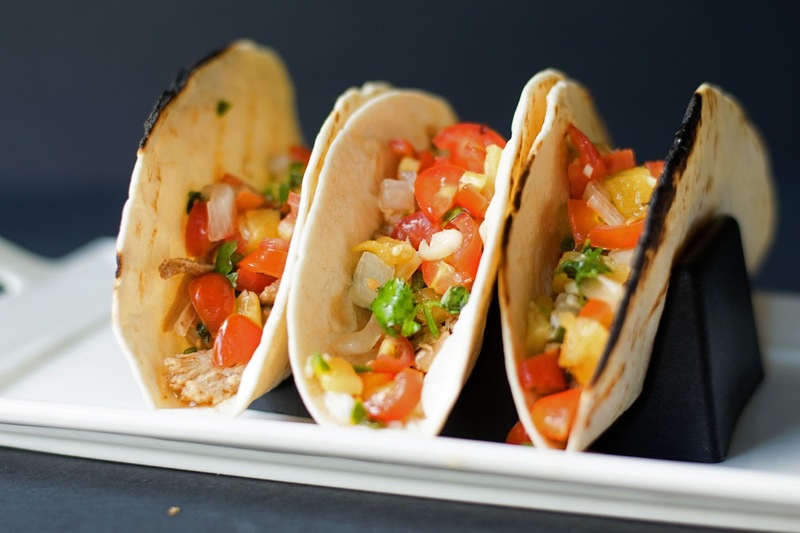 It's not something I typically do, but I decided to give it a try and these Slow Cooker Pork Tacos w/ Pineapple Salsa were born! To begin you will place the pork chops into the slow cooker. You will notice that these are actually frozen. Yes, from the freezer! You are going to love this! This will be the sweet component of the "sauce". Pour the water into the slow cooker. Then pour in the lime juice. Now it's time to add the seasoning. And bay leaves to the slow cooker. Place the lid on the slow cooker, and turn to low for 8-10 hours. 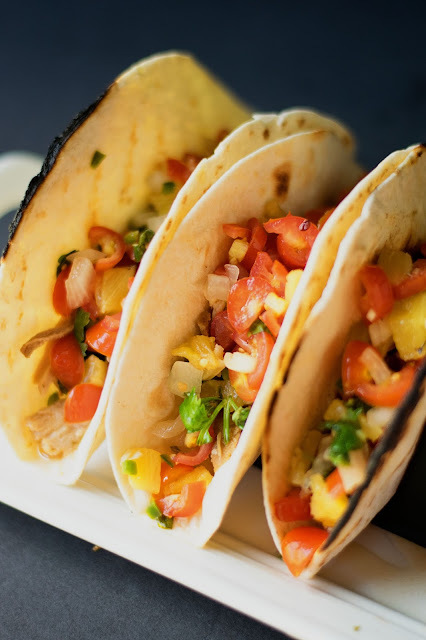 While the pork chops are cooking, you can make the pineapple salsa. To breakdown the pineapple cut the bottom and the top off. Next take your knife and cut the skin off of the sides, cutting in strips from top to bottom. Once the peel is off, cut the cheeks from the core. Preheat your grill pan or grill and oil it. Cut the pineapple into long slices, and grill on each side for 2-3 minutes. Look at how lovely that is. Next you will chop the tomatoes. I know that usually you would use Roma tomatoes for this, or even vine ripened, but my husband is not a fan of tomatoes. I found the cherry tomatoes to be sweeter and less acidic, and he seems to like these better. Once diced, add them to a mixing bowl. Now you can dice up the pineapple and add it to the bowl as well. Squeeze the lime juice into the bowl. Then toss in the chopped cilantro. Stir everything together, taste for seasoning, cover, and place in the refrigerator to chill. But before you do that, just take a minute and look and how colorful and festive it is! Beautiful! Once the pork chops have finished cooking you can remove them to a plate and shred. The meat will be super tender and will literally just fall apart. Return the shredded meat to the sauce in the slow-cooker and you are ready to assemble the tacos. I like to warm my tortilla shells on my grill pan, but you can wrap them in a damp paper towel and place them in the microwave for 1 minutes. These Pork Tacos with Pineapple Salsa are not only flavorful, but they are so bright and colorful as well. When you see them on the plate, you can't help, but to grab one and put it in your mouth! 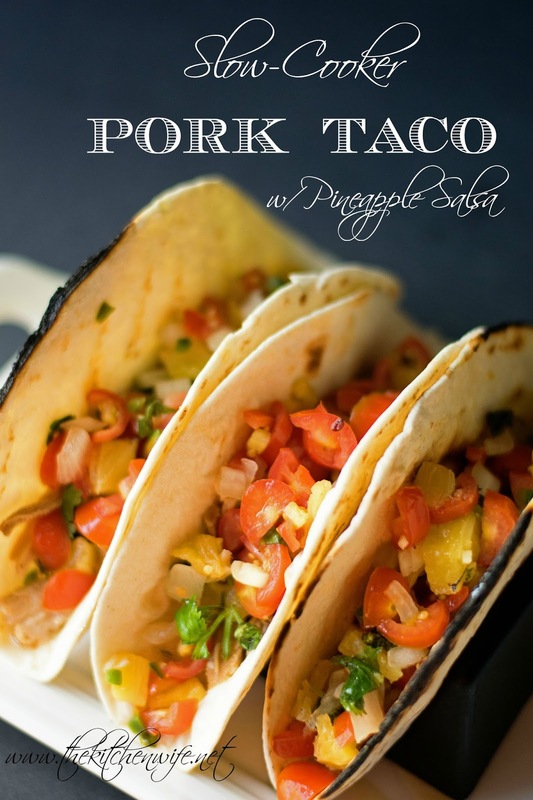 The sweetness of the pineapple compliments the smokiness of the pork. So very good. I know you are going to LOVE this simple meal so get in the kitchen and give a try TONIGHT! To a slow cooker add the pork, coca-cola, water, lime juice, chili powder, cumin, salt, oregano, onion powder, smoked paprika, bay leaves, and cayenne pepper. Give it a little stir, cover, and turn on low for 8-10 hours. For the salsa: Peel and fresh pineapple. Cut the cheeks off. Cut the cheeks into strips, and grill for 1-2 minutes on each side. once grilled chop the pineapple into a small dice. In a mixing bowl, combine the onion, tomatoes, jalapeno, lime juice, pineapple, and cilantro. Season with salt and pepper, and stir everything together. Cover and place in the refrigerator to chill. When pork has cooked, remove the meat from the slow cooker, and shred. Return the meat to the juices in the slow cooker. Heat your tortilla shells and assemble your taco.